Remember the days when, instead of longing for physical mail besides your bills and the umpteenth credit card offer you’ve received that week, you longed to receive an email and regular physical mail was plentiful? Now, the reverse is true as email inboxes are full of spam and you find yourself wishing for a fun piece of actual mail. MyPostcard is a service that works to add the personal touch to your physical mailbox. It allows you to use your own photos to easily create and send customized printed photo postcards and greeting cards. In a matter of moments, you can use its app or website to send a personal note anywhere in the world. Just to make sure someone knows you’re thinking of them. We talked to founder, Oliver Kray, to find out more. “I was spending my 2013 summer vacation on Santorini in Greece and as I was looking for cool postcard options, I thought to myself: How cool would it be if I could send my personal photos as real postcards!” He says. From there, he started looking at existing options on the App Store but could only find poorly designed and badly crafted” alternatives. Spotting a gap in the market, Kray worked on his vision, eventually launching MyPostcard a few months later. Since then, the products available have been expanded with the team continuously working toward their goal of “becoming the best post- and greeting cards app in the world.” The company now boasts more than 500,000 users. With headquarters based in Berlin, and an office in New York, cards are printed in both locations. Depending on the country of destination, orders are sent from one or the other. In every case, one flat fee is offered to simplify the process for customers. Downloads have grown with over 1 million downloads of the MyPostcard app, giving the team plenty of room for expansion. Detecting how different countries prefer different forms of mail is crucial to MyPostcard’s success story. It’s now possible to buy a set of personalized postcards or photo prints, for instance, as well as individual pieces of mail. Gift cards can also be included. “We’re offering our customers an ever-growing range of designs and templates for every occasion – this includes birthday and mother’s day motifs, Christmas as well as Hanukkah,” explains Kray. As he points out, while there are large competitors in the U.S., most offer their services via desktop clients rather than apps. 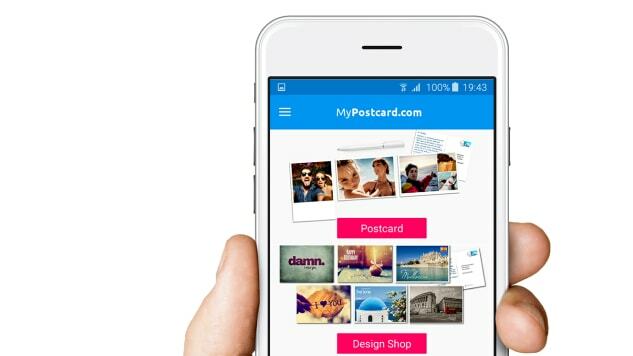 MyPostcard’s greatest strength is being able to do everything from your smartphone. As with any lifestyle-based technological innovation, convenience rules above all other factors in terms of what people appreciate the most. In the case of MyPostcard, it’s certainly straightforward. In a matter of a few minutes you can easily apply different styles or templates to your designs, before inserting photos just like you would if you were uploading something to Instagram. Type up a quick or longer message, and you’re pretty much set. With prices starting at $2.29, it’s a tempting proposition for those times when you need a more personal touch than simply shooting off an email. The app is available on Google Play, App Store and the MyPostcard website.